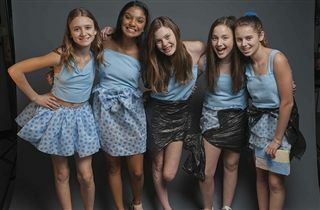 Students in Danielle Brown’s middle school Fashion Design elective recently completed a project inspired by the unconventional materials challenge in the reality TV show Project Runway. Students designed and constructed garments using unusual materials and showed them off at a photoshoot run by US photography teacher David Miller. Students really enjoyed modeling their creations for the camera!